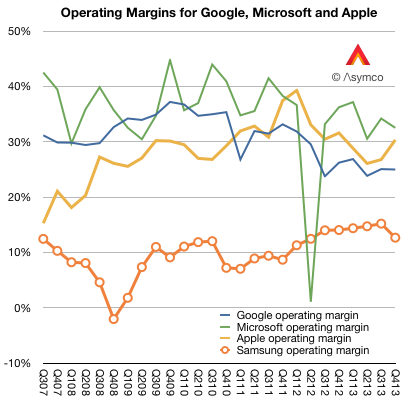 In the last two years Apple’s margins have declined but so have Google’s. And although Microsoft’s fell, they fell less than Apple’s and thus overtook it to remain slightly more profitable (32.5% vs. 30.3%) into Q4. So although Apple stabilized, it did so at an extraordinarily high level, well out of band for a hardware company. 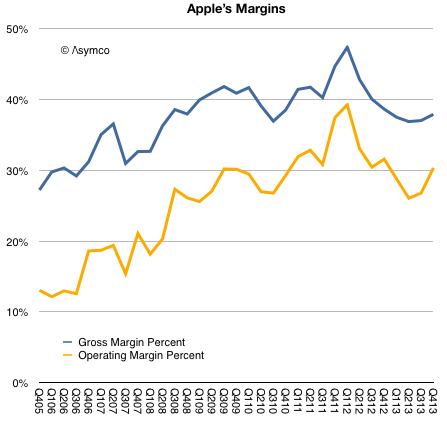 Thus the question remains: Are Apple’s margins a fluke? Is the recent rise of margins to levels far above those of a comparable hardware company and into the realm of software and services sustainable? The simple answer is to assume that the iPhone and iPad, which make the bulk of revenues and which explain much of the rise, enjoyed a temporary buzz which allowed them to be priced at a premium but as that buzz wore off, the pricing and margins would decline. This is common with fads and fashions. But the situation is far more nuanced. If the margins were due to mere novelty, the effect should not have persisted over so many years. Pricing data shows that the iPhone remains exceptionally valuable and that the iPad, excluding line extensions, has also held the line on pricing. The missing piece in the puzzle is that the iPhone and iPad and iPod touch and Apple TV are pieces of an inter-dependent network of assets. The iTunes stores, Apple’s services and Apple Retail are easily ignored because they are not “profit centers” but I believe they are a key component to the sustainment of these margins. In other words, the iPhone and iPad enjoy margins not just because they are new and well designed. But also because they form part of a ecosystem. The key word is ‘system’. The user buys into a system not just what the device embodies. This is why I’ve always said that the iOS product businesses should be thought of as “hardware as a service”. The inspiration comes from the notion of “software as a service” which posits the idea that software purchases should be thought of as services and thus recurring revenues. iOS devices are part of a service matrix: the user experience in the stores, the after-sales support (including the easily ignored Applecare), the broadband supplied through operator service (which is part of a trillion dollars of value), the apps and content that can be purchased (which add up to a mountain of money), the network effects of iMessage and iCloud and now iRadio and Match and Siri. These services attachments are well understood as great business models and underpin some of the most celebrated businesses to emerge in the last decade including Google, Amazon, Facebook, Box, Dropbox, Windows Live, etc. It’s curious therefore that whereas these other businesses are highly valued as services, in the case when the service is a component within a larger system, the value is missed. In an integrated context the connection between services and high margins is not understood. The reason may be the absence of robust systems analysis and a preference for the facile explanation.